Classic Ceilings exclusive collection line of decorative architectural products. Classic Ceilings Signature Collection is dedicated to American Made products. The collection consists of U.S. manufactures who design and produce their products in America. By purchasing products from the collection you are investing in the highest quality and standard of production. With American made products being built and shipped locally you are also reducing our carbon footprint and investing in a greener America. We invite you to consider profiles from this collection in your projects and celebrate American craftsmanship, creativity, and innovation. Classic Ceilings Decor Collection consists of imported architectural products from various parts of the world. The collection consist of unique profiles and sizes to provide distinct solutions and complement the vast range of products offered by Classic Ceilings. Classic Ceilings Collection: Domes - Dramatically enhance an entry way or room and increase the ceiling height with a decorative architectural ceiling dome. 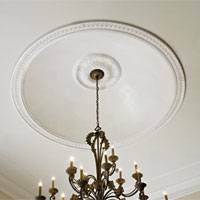 Classic Ceilings Collection: Crown Moldings - Intricate crown moldings with precision detail to add an elegant decorative architectural touch to any room or outside of a building. Classic Ceilings Collection: Moulding Accessories - Molding accessories to complement moldings, such as molding blocks, pre-mitered inside corners and pre-mitered outside corners, or Focal Point's Quick Clips molding installation system and Focal Point's Moulding Mates.